If you are like most of us, one of the most common issues you face is the constant build-up of objects around the house and on most surfaces… in other words, clutter. To make the most of your space, at Maid for Portland we’ll focus on ways to help contain all those things you can’t part with but need to find at some future point. In this post, we’ll focus on a spot where you might find yourself spending a little more time during the winter: the kitchen. Most of us have heard of (and probably use) drawer organizers for cutlery, cooking utensils, and even junk drawers. But one of the most wasted spaces are shelves. Unless all your kitchen items are perfectly symmetrical and can stack, you will end up with disorganized storage, wasted space, or may have difficulty finding what you need. Here are a few ways to maximize shelf space and make things easier to find. 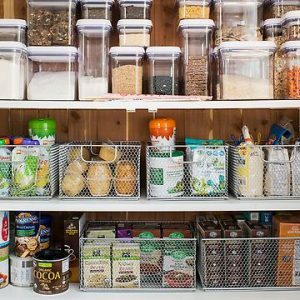 Pantry or food storage: particularly if you have a long, deep cupboard or refrigerator, a good way to find (and cycle through) your food is to use on-shelf container systems. These don’t need to be expensive, and come in materials from plastics and metals to bamboo. Two handy storage styles include the dispenser type, and a sturdy box or bin. Can dispensers conveniently allow you to store and retrieve your food or beverage containers both in the fridge or cupboard shelf. 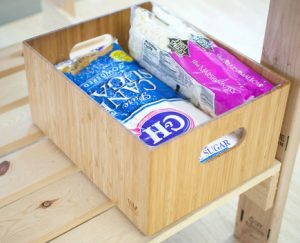 A bamboo box with cut-out handles that can hold packages of dry goods, such as nuts, pastas, rice, flour or sugar, sauce or seasoning packets, etc., fits well on most pantry shelves. 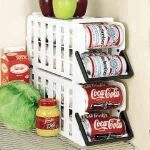 These allow you to better utilize your space, taking advantage of vertical space while allowing for other items to be stored and reached alongside the container. If you can’t afford to install pull-out shelves, another handy organizational tool is a small set of drawers, which are perfect for storing small containers of snacks, baggies, and other odds and ends in your pantry. Many organizers are embracing the trend of buying in bulk and storing food in mason jars and other reusable containers. This not only makes better use of space, it cuts down on packaging waste. Cupboard organization: consider the types of items you frequently sort through to find what you’re looking for. For example, teas, or spices. For some, a spice caddy on the cabinet door is a good solution to quickly find the items you use most often. Others might use a spinning, “lazy susan” type rack for jars of spice. If you tend to use bulk or loose spices, you might also consider a somewhat unconventional storage solution, such as a metal plate on the kitchen wall or above the stove with magnetized jars of spices. A magnet in the lid holds the jar to the metal plate, allowing for the spices to be easily stored, seen and found, adding a decorative aspect in the process. If tea is your “bag,” you may have a shelf in your kitchen full of boxes and tins that ends up packed like a game of Tetris, which can make it challenging to both find what you want, and to cycle through your tea inventory. Eventually, boxes with only a few tea bags end up taking space, and if you’re not careful, you can become the victim of a box avalanche. 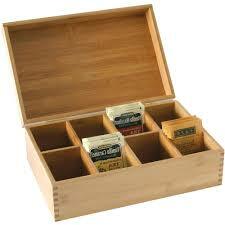 Avoid many of these issues by purchasing or making a tea organizer. There are many types to choose from, but two good choices available for purchase include a sturdy plastic or bamboo box, both with a hinged lid and enough teabag-sized compartments inside to store 6 – 8 boxes of tea (or fractional combinations of dozens of boxes, as the case may be). We hope these ideas will come in handy with your own kitchen organization. An organized space is not only easier for you, it’s easier (and less expensive) to clean. As always, we’re here to help you keep clean… and organized! When you call for an estimate from us at Maid for Portland, if you have organizational projects with which you’d like assistance, let us know so we can provide you with a custom bid.